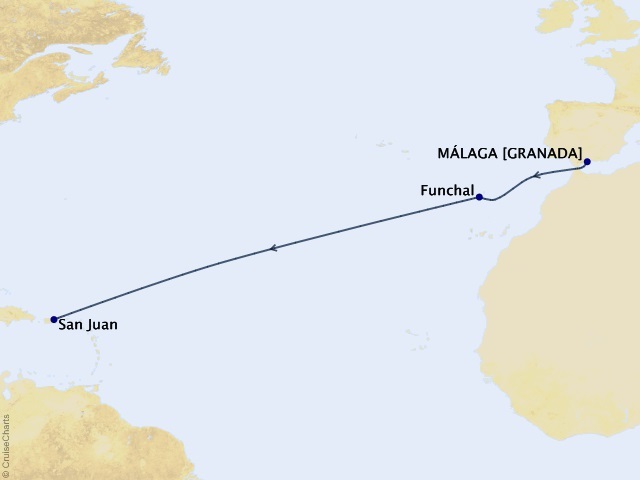 Departing from Malaga on October 27, 2019, prices starting at $2,999. Twin mega-yachts SeaDream I & II are intimate boutique ships that provide a unique travelling experience unlike any other cruise vacation. The expression “yachting” is not only a statement about size; it’s a lifestyle aboard our intimate vessels with the service of 95 crew members and 112 guests that make each guest feel like they are on their very own private luxury yacht. 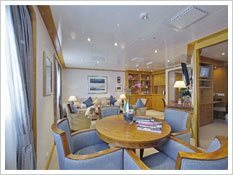 Chic and stylish, SeaDream’s 56-stateroom yachts are favored for its elegant informality, highly personal service, inclusive open bar and gratuities, all ocean views staterooms and suites, luxury accommodations and world-class cuisine. 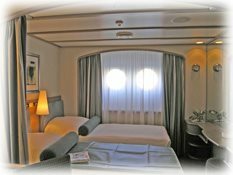 Come aboard a SeaDream Yacht and you will discover just how different it is from big ship cruising. With just 56 privileged couples, it is intimate; the pace is relaxed or active, the service is incredibly personal, and the entire SeaDream experience is unlike any other. It is in the smallest of details that the soul feels pampered. It is SeaDream's attention to the smallest of details that makes the cuisine aboard SeaDream a gastronomical treat. Indulge with selections like lobster, filet mignon, and chocolate soufflé. Should you prefer vegetarian, gluten-free, or raw foods; the choice is all yours. Topside Restaurant is the perfect place to enjoy a late breakfast, casual lunch, or a gourmet dining experience. It is the perfect venue to enjoy SeaDream's cuisine, yet not miss a moment of your destination. Dinner may also be served in the elegantly appointed Dining Salon. The finest Belgian linen, Porsgrund porcelain, and Hadeland Crystal are the perfect backdrop to the impeccably presented cusine. Guests enjoy open seating for all meals. There is also 24-hour room service that features light, healthful offerings. Finally, a wide selection of Canapes and Caviar are served in the Main Lounge, and fresh-cut sandwiches may be found at the Top of the Yacht Bar and by the swimming pool. Take time to watch the world go by on a Signature Balinese Dream Bed. These specially designed beds are the perfect place to catch the views, read a book, and sip your favorite beverage. Select a cozy corner of the yacht and take that little cat nap you have missed all year. These highly popular, double sun beds are raised above the sightline of the yacht's railings to provide unobstructed views. Large umbrellas can provide shade when desired. Guests sunbathe, read, look out to sea, or just snooze. The Piano Bar is a relaxed lounge area where one may enjoy an after dinner cocktail and request a favorite tune from the piano player. Feel free to sing-along, or practice your gambling moves in the nearby Casino. A favorite among all guests! Signature Champagne and Caviar Splash™, featured during Caribbean voyages, is a true celebration of the yachting lifestyle as it exemplifies "Casual Perfection." A toast to crew and guest alike - to the good times shared and to meeting aboard again soon. A gourmet barbecue served on bone chine on a sandy white beach is a celebration of the yachting experience in every delicious decadent bite. In lieu of a sandy beach, the celebration is held poolside. At the sound of the yacht's horn... Start the music, let the bubbles flow, and enjoy a bite of caviar. Tomorrow can wait. Basically, SeaDream I and II sail on scheduled itineraries. Nevertheless, although SeaDream yachts depart their first port of call and arrive at their last port of call as scheduled, arrivals and departures at intermediate ports are not necessarily, cast in stone. SeaDream's Captains have the authority to adjust for local opportunities. SeaDream's yachts can make unscheduled calls at small ports to visit a local fish market, for example, or remain longer than scheduled in a secluded bay so guests can enjoy a few more hours of water sports. Professional Golf Simulator: Select from 30 world renowned golf courses and enjoy them in air-conditioned comfort. Equipped with his and hers clubs, a seating area, and in lieu of a caddy. A bartender from the Top of the Yacht Bar is available to ensure you remain hydrated. An elegant library, cozy and quiet, offers a large selection of books ranging from the classics to bestsellers. Magazines, newspapers, board games and computers with internet connections, are also available 24 hours a day. SeaDream's Main Salon on deck 3 is where SeaDream welcomes guests during embarkation with champagne and caviar. This facility is also enjoyed by guests for pre dinner cocktails on some evenings, for dancing, for movie presentations as well as to just relax and listen to the pianist. The SeaDream yachting experience is a casual affair. There is no formal dress code. When asked about what SeaDream's guests wear during the day or in the evening, they always respond by using the phrase "Resort Casual"--- sportswear for the activity of your choice, easy to wear and comfortable attire for shore-side visits. Guests may have the chance to go snorkeling with the Captain in an area he knows well and enjoys. The Activities Director might lead guests on a shore-side hike that he has uncovered on a previous visit. Guests may also want to join SeaDream's Chef for a visit to his favorite patisserie or to a fine fish market where he plans to select some delicacies to put on the menu that evening. There is no cost for these crew-led opportunities. Unlike Cruise Ships that usually arrive at ports of call in the early morning and depart in the evening of the same day, SeaDream yachts overnight at many ports of call. Here are a few examples: One port in the Caribbean where SeaDream overnights is Gustavia on the French island, St. Barts. When SeaDream sails in the Mediterranean, they frequently overnight at the French Riviera port of St. Tropez. The point is the action does not even get started in ports such as these until late in the evening and SeaDream has found that its guests are active people who do not want to miss anything. The Boutique is open when at sea to allow guests to purchase duty free. It offers fine gifts of international name brands, sports and yacht-wear, both with and without SeaDream logos, and necessary personal items guests may have neglected to bring with them. SeaDream's Marina is equipped with all of the water sports equipment required for a proper yachtsman's holiday, including wave runners, personal kayaks and sailboats, snorkel gear, a floating island, and more. With a minimum of three Marina Days on your holiday, you will be able to play with them all. Each yacht features a large water sports Marina that is lowered from the stern in secluded, clear bays and coves. This, of course, is offered weather permitting and with port authorization. A rejuvenating experience awaits you at the SeaDream Spa. Discover the ultimate in Thai therapies, and behold the secrets and luxury of their time honored spa treatments. Achieve pure bliss and tranquility in a sanctuary for you to relax, unwind, recharge, and rejuvenate. Choose from an extensive range of spa favorites such as the Asian Blend massage, Soothing Aroma Massage, and Traditional Thai Massage. The SeaDream Spa is an experience that you will surely want to return to again and again. You may enjoy some of the treatments in the open air private massage area, cooled by gentle sea breezes (weather permitting). The SeaDream Spa is the only Thai-certified spa at sea. The Fitness Center features ocean views, wonderful lighting, and state-of-the-art equipment. Select from four treadmills, an elliptical machine, two recumbent bikes, and free weights, all with flat-screen TVs and DVD players. Cool towels and refrigerated bottled water are also available. The generous teak decks and lounge chairs are waiting for you poolside. A saltwater pool and freshwater hot tub, fresh towels, refreshing drinks and cocktails served by the crew, will ensure you will enjoy your time spent on deck. Sunglasses need to be refreshed? No worries; they will take care of that for you, too. SeaDream's Sommeliers are masters of their wine cellars at sea that feature many of the world's most classic vintages and an array of little-known, but surprisingly enticing wines. Classic wines are available for purchase. The Sommeliers also pour a selection of fine reds and whites complimentary at luncheon and dinner. 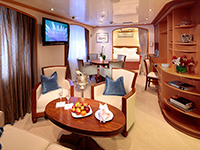 These comfortably appointed staterooms provide a choice of two twin beds or a queen size bed, a seating area with a sofa, coordinated chair and cocktail table, a spacious closet and built in dresser and writing desk. As well as a marble lined bathroom with multi jet shower. 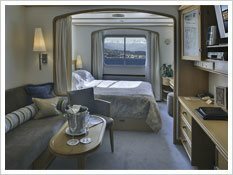 Yacht Club Staterooms on Decks 3 and 4 feature a large picture window while Yacht Club Staterooms on Deck 2 have two nautical windows. The size of the Yacht Club staterooms on deck 2, 3 and 4 are identical other than this difference in the windows. Consists of two Yacht Club Staterooms combined resulting in 2 full baths and 2 closets. Features include 2 refrigerators with soft drinks, beer and water, 2 writing desks, personalized stationary, 2 couches and tables, direct dial telephones, personal safe, individually controlled AC, hair dryer, fine Belgian linens and down duvets, bath amenities by Bulgari, multi jet shower massage units, choice of down or synthetic pillows, slippers and beautiful SeaDream bath robes. The room may be set with 2 beds or with one bed and a table for 4. For entertainment there are state of the art entertainment systems with flat screen TVs, radios, CD and DVD players. The desk is internet ready and laptops are available on request.Commodore Club Double Stateroom are identified with the symbol * on the deck plan. 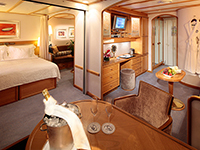 These staterooms are numbered: Deck 3 - 304/306; 320/322; 303/305; 317/319. Deck 2 - 204/206; 208/210; 203/205; 207/209. Suite 400 located on Deck 4. Casually elegant and comfortable, the Admiral Suite features a separate living and dining area, master bedroom and 1 ½ baths. The separate and private en-suite master bedroom features a queen sized bed and master bath. Basked in light, the suite features 3 panorama windows. Individual entertainment centers are featured in the living and bedroom suite and include flat screen TVs, radios, CD/DVD players & iPod docking station, as well as a Nespresso® machine. This suite includes a thoughtfully appointed separate master bedroom suite with a queen size bed and bathroom with massage shower, separate soaking tub, and views of the sea. A spacious living and dining area with a half guest bath and a writing desk with internet ready connection. Features include a refreshment area and both the bedroom and living room provide a state of the art entertainment systems with flat-screen TVs, CD and DVD players.